If you truly want to change the world, you begin by educating the children. That is the philosophy behind the ARES Project. ARES is an acronym for the African Ruggedized Education System and a solution for the problem of education in rural communities with minimal resources. Remote rural schools often have limited access to books, paper and writing materials, as well as intermittent power and no internet access. Bonnie Sutherland has been working in Africa since 1992 when she and her late husband, Don, visited Kenya and saw the great need for teachers and students. Don and Bonnie were both teachers in Delta, British Columbia and began shipping containers of books and other materials to Africa. That led to the formation of the charitable Afretech Aid Society and to working with Rotary clubs to send larger and more frequent shipments, which grew to include entire libraries, computers, medical equipment and more. 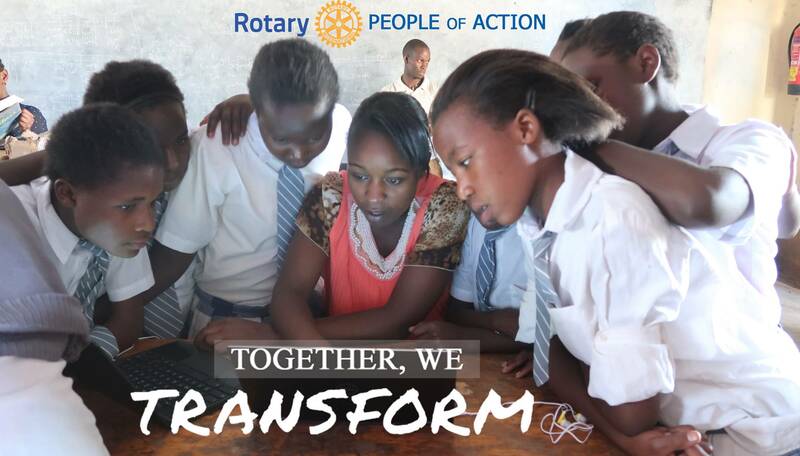 In 2011, Mark Knittel, a Rotarian from Bellingham, Washington, took part in an Afretech/Rotary service project in Kenya - installing a computer lab in a community library. Mark has an extensive background in technology, including 20 years with IBM in the USA and in France, before moving to Bellingham. Learning about the problems with intermittent power, power surges, dust, heat and theft, Mark was determined to find a better way to provide a computer enhanced education model. Mark created a small server that would be rugged to deal with heat, dust and power issues. That prototype was used in the first Kenya test project in 2015. The case is designed to prevent dust intake, while the components minimize heat issues. The ARES server can be charged overnight and will run on a battery - so that if the school loses power, the system still operates. Teachers could literally hold a class under a tree in the middle of a field. Working with other charitable groups which create digital educational resources, Mark stored educational data on a solid state hard drive (SSD) so that ARES operates like an internet in a box. ARES has educational resources from pre-school to post-grad, including thousands of video tutorials and books, the entire Khan Academy curriculum, STEM resources, over 300 TED Talks and the massive educational Wikipedia library. ARES also has agricultural guides and medical reference material to serve as a resources for the entire community. Students access ARES through basic, inexpensive laptops, such as Chromebooks, as well as through existing school computer labs, tablets, smartphones and any other wireless device. Up to 50 wireless devices can connect to the ARES server at a time, with each user able to access different resources on the server. The power cords stay with the teacher or librarian, and every school is required to build a locked storage room to minimize the risk of theft. Since the data is stored on the server only, it also minimizes any damage that viruses might do. To the users, it may appear that they are accessing the internet - but they aren't. Everything is on the server and the data is both safe and appropriate for students. But technology is only part of the solution. The ARES Project also provides training for teachers on how to use and to teach using the ARES materials. Many teachers use only rote memorization and repetition due to the lack of available resources. In the January 2017 pilot project, the ARES system was provided to a school that ranked towards the bottom of Kenya’s approximately 2,600 secondary schools. At the end of the next quarter, that remote rural school was in the top 30. Through the ARES Project, rural students have as much - or more - access to education as students in urban schools. In January 2018 the team returned to Kenya to install the Version 3 model of the ARES in 6 secondary schools. The project also included small pico projectors and speakers to enable the teachers to present the ARES material to the entire class. Those pilot projects have prepared us for the next stage using a global grant. Four local Rotary clubs in BC and Washington (Bellingham, Langley Central, Chilliwack Fraser and North Delta) have each donated $5,000 USD which, with matching grants from Rotary and the Government of Canada, will provide funding of over $129,000. The first phase of the Global Grant was installed in January 2019. We expect the entire grant to be completed within the next year, so that we can then apply for a second grant. As of February 2019, ARES labs have been installed in 47 schools. We are changing the lives of a generation of students. Those changes will continue to ripple outwards to change the lives of their families, their communities and even entire countries. ARES is a revolution in education for rural communities anywhere in the world. For more information on the ARES Project, visit the ARES website at http://www.ares.education.